Attack Pattern: Appears from several pits then breaths fire. Quick Facts: Due to bad translations Volvagia was mistranslated into Barba, but it is Volvagia. A red dragon who lives in lava and attacks with fire. Boss of Three Eye Rocks palace. Its name was changed to Volvagia for the Collectors' Edition version. Quick Facts: Appears as a boss in the Fire Temple. Can only be stunned with the aid of the Megaton Hammer; is then susceptable to direct hits from the sword. The lava dragon known as Volvagia is a fierce beast. He has appeared twice in the Legend of Zelda. Its looks are quite similar in both games. You might say that it looks more like a huge snake that rises from the depths of the lava pits and breathes fire trying to take out Link. Other than that the Volvagia in OoT looks more like a more detailed version of that in AoL. In the last of the main temples, Three Eye Rocks Palace, Barba awaits you as the final boss to the final statue. 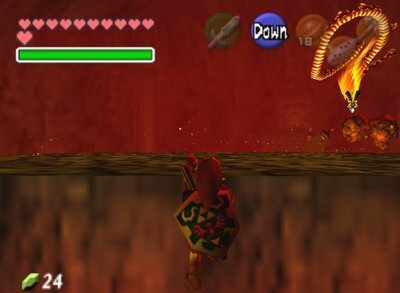 As the fight begins Barba pops up from one of the three lava pits, trying to hit Link by breathing some fireballs. Using magic to jump higher, Link can hit Barba's head with his sword and eventually defeat it. 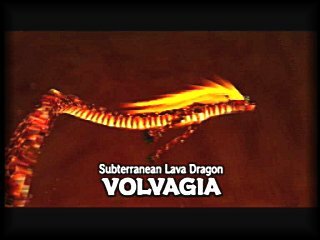 Volvagia returns in this game once again as the fiery lava dragon. He was defeated by the legendary Goron Hero many years ago, but with the arrival of Ganondorf he was brought back to life. Volvagia roams inside the Fire Temple inside Death Mountain Crater and has captured all the Gorons in prison cells all across the temple. After finding the Megaton Hammer, Link is able to slay the dragon once and for all. The head will fall on the ground just before Link and turns into a Heart Container. Volvagia pops up from one of the 9 holes in the ground. This is noted by the light coming from that hole, when the battle advances he may fake out the few times. Then he breaths fire and waits a few seconds before retreating. On this moment while Volvagia is vulnerable Link can use the Hammer on his head to stun him temporarily allowing him to strike the Dragon several times. After this the dragon returns into the hole again and goes into phase 2 or 3 in an alternating fashion. The Fire Dragon will ascend from the hole again and will try to follow Link all over the place, while trying to breathe fire into Link. After a while Volvagia returns into a hole and goes back to phase 1. In this phase Volvagia will rise up to the ceiling of the level and multiple stone rocks will fall down from above. Link can easily avoid these by hanging onto a ledge as shown in the picture below. Once again the dragon will return into a hole and goes back to phase 1. That dragon was very scary! feed them all to Volvagia! Oh, it really is Link! with you, but now's not the time. dragon, please save my people! Volvagia's name had a very strange translation when AoL was made. Japanese people don't have the sounds 'V' and 'L', therefore they were replaced by 'B' and 'R' repectively. So the name "Barubajia" could be deformed into Barba. Also it is well known that localisation was not very advanced and sophisticated back in the 80s. However nowadays things are better and the Japanese alphabet has a katakana replacement for the 'V' sound. Therefore the name became "VARUBAJIA". However this would still mean his name is "Valbagia" instead of "Volvagia". The name was changed from Barbara to Volvagia for the collector's edition of AoL. The French translations is just a slightly altered one, it seems to have more in common with Volcano. This page was last modified on 12 February 2006, at 17:59.